This sequel to Studio Moderne is inspired by 1970’s glamour, Art Deco and Neo-Egyptian architecture. Pictured: Montclair. We chose the name 'Century Suite' because it is rooted in the architectural strength of the mid-20th century, with graphic and dimensional glazed tiles that create geometric and over-scaled back drops. Nothing cements the reputation of a Hollywood blockbuster more than a sequel that lives up to the original and expands the series. In the spirit of sequels, Walker Zanger revisits the popular ceramic Studio Moderne collection to create an extension of the existing designs called Century Suite in collaboration with famed interior designer Michael Berman. The Century Suite draws inspiration from 1970’s glamour, Art Deco and Neo-Egyptian architecture—exhibiting bold, graphic patterns and architectural backdrops. The minimalist concentric curves of “Highland” echo the architecture at the Hollywood bowl (located on Highland Avenue), and the interlocking, elongated hexagons of “Montclair” are inspired by mid-century Neo-Egyptian styling. 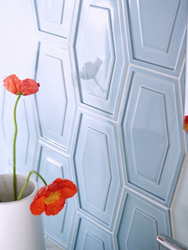 “Ambassador” and “Diplomat” are two patterns that can be used separately or in tandem, and “Rambler” reimagines one of Studio Moderne’s most popular designs so it can be applied as a backsplash. “Not only is this collection beautiful to look at, but from a designer’s standpoint, it has the simplicity for longevity. That is why I re-partnered with Walker Zanger—it is a visionary, trend-setting brand,” said Berman. For more information about Studio Moderne: Century Suite or other Walker Zanger products, please visit walkerzanger.com.